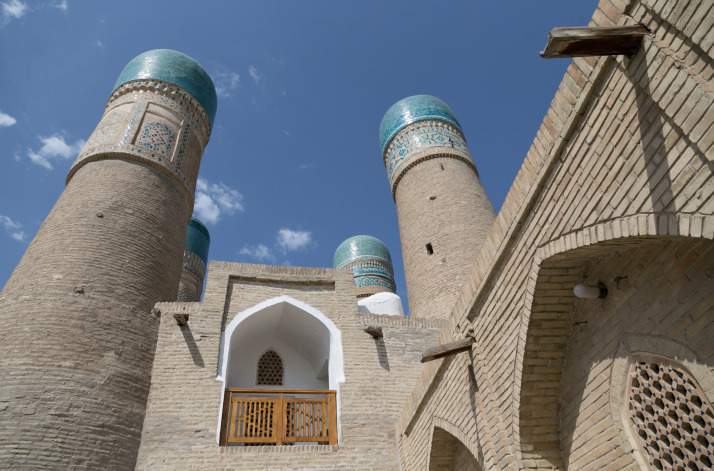 Although it shares with Samarkand similar grand architecture, Bukhara is a very different place to visit – better-preserved, but because of that, more touristy. The city has had a series of incarnations but has always been of significance, either politically or religiously. From the 16th century to 1920 it was the capital of a ‘khanate’ before being captured by the Bolsheviks. In 1924 the city was absorbed into the Uzbek SSR. 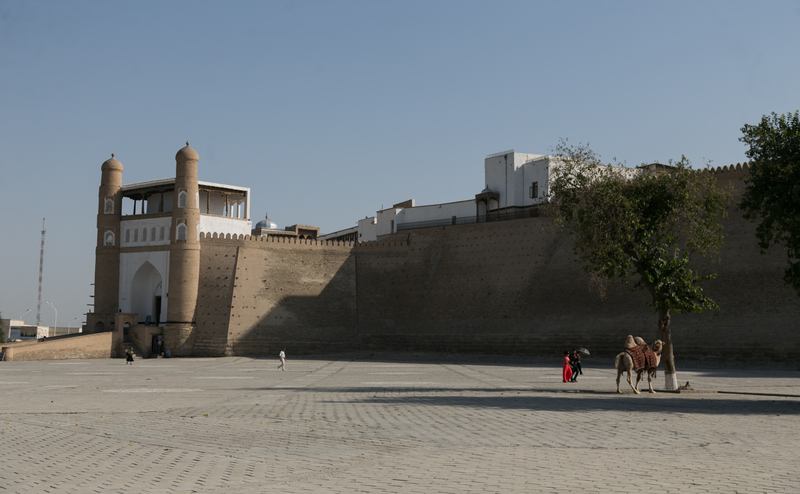 Despite the Russians, Bukhara is still at its heart a medieval city and most of the mosques and medressas survive in good condition. 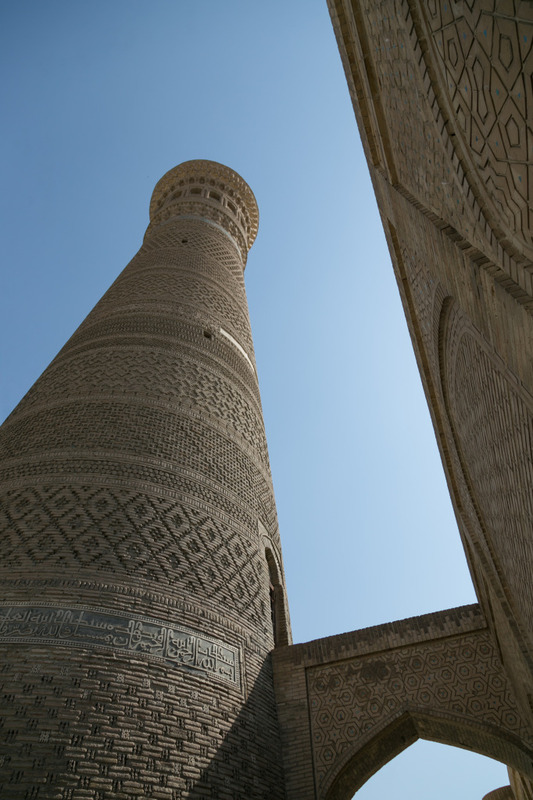 The most spectacular sight, which we returned to at several different times of the day, is the Kalon Minaret – built in 1127, this 47m high tower has survived the invasion of Chinggis Khan. It was partially damaged by the Soviets but has been well-restored and its golden brick patterns reflect the light beautifully. 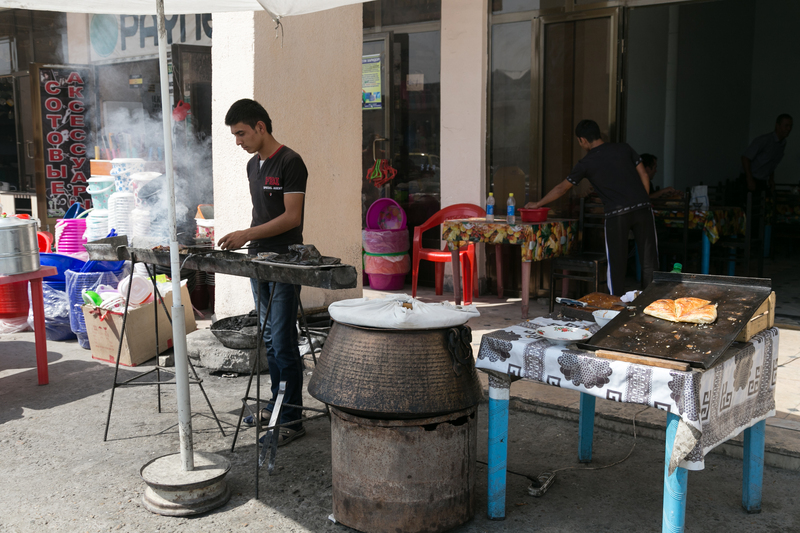 We began our three days of wandering around Bukhara’s baking hot streets with the Ark. Sadly this great construction does not float, although there was a solitary camel standing outside for tourists to have their photo taken with. Unlike much of the other architecture we’ve seen, the Ark is not a religious building but instead was a fortress and palace for the Emirs of the khanate. It’s also a bit like a reverse TARDIS, as much of the vast inside is inaccessible. Many of the buildings are now used as little museums of Bukharan history, some more interesting than others. We shared the experience with loads of tour groups, the first we’d really seen in any number, and as it was a Sunday, lots of locals too. Any prospective visitors should note that the entrance fee of 4,500 sum is separate from a 4,200 sum fee for a guide – we managed to get the latter back on exit as we a) hadn’t been offered a guide, and b) hadn’t wanted one. 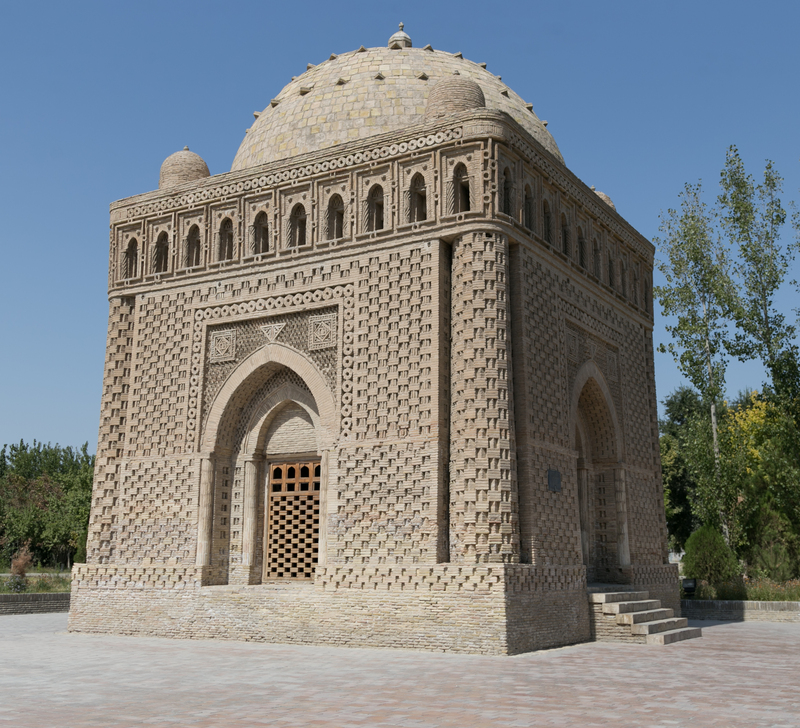 Bukhara also has any number of smaller mosques and mausoleums. We passed several of these in our wanderings, including the Chashma Ayub Mausoleum, where apparently Job found water by banging the ground with his staff, and the lovely 9th-century Ismail Samani Mausoleum. Of course we also looked at the bazaar nearby and had a truly excellent lunch of plov for the kingly sum of about £1 each, including free of charge a friendly conversation with the nice chaps at the next table, who didn’t seem to mind that we couldn’t understand more than a couple of words of what they said. On day two in Bukhara we started out by visiting the cute little Char Minar, once a gatehouse for a medressa. The towers aren’t minarets but just decoration, we were able to climb to the roof to see the old town from a different perspective. We also went into the Kalon Mosque next to the minaret. Julie and I went to the effort of putting on headscarves as it asked us to, but frankly we shouldn’t have bothered as nobody else did. The mosque, which can house 10,000 worshippers, is vast in size although it’s mostly an empty space with some more beautiful tilework. We felt it was a bit overpriced at 6,000 sum (£1.20 – but a lot in Uzbek terms!). We declined the offer to spend 45,000 sum (£9) each to climb the minaret, although we would have liked to. On our last day in Bukhara we ventured off the beaten track a little, first venturing to a couple of medressas that were on the map but not described in the guidebook. One was closed, but the door was open to the other so we poked our noses in. There was (predictably) a souvenir shop but mainly the place was under renovation. 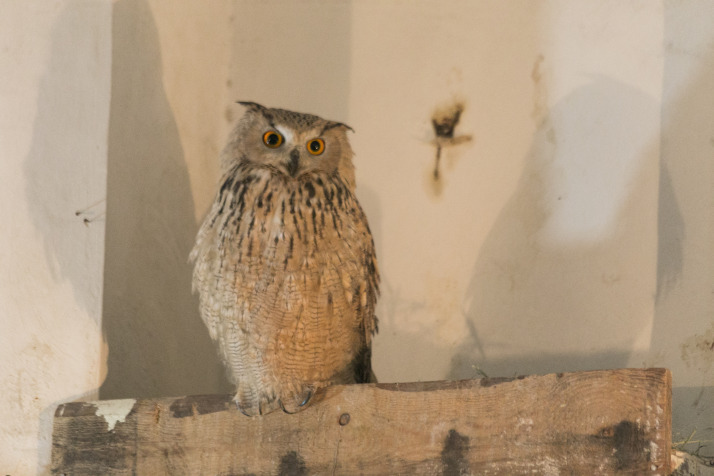 In search of the stairs to the second floor one of the workers invited us into his workshop-come-living space, where he turned the lights on to show us a large owl! Apparently he’d brought it up from an owlet and it ate mice and snakes. An owl was the last thing we expected to find in a medressa, but it was a nice surprise. We wandered through the streets of the old town to the Jewish cemetery in increasingly hot sunshine and finally retreated to the ‘small’ market for another bowl of good plov. 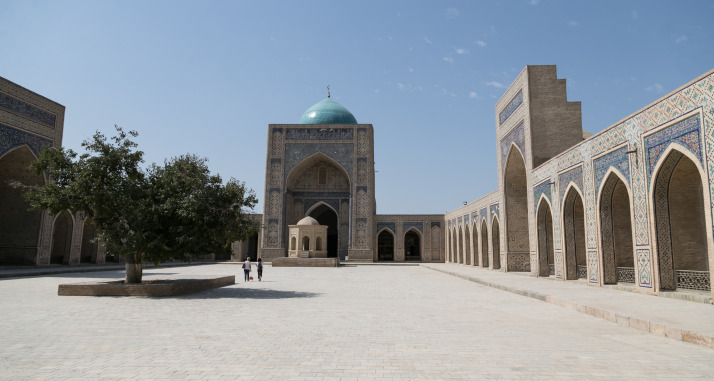 There wasn’t much left to see in Bukhara, so we spent a pleasant hour in a teahouse drinking spiced tea and coffee and eating local sweets, and also visited an excellent contemporary photo gallery full of portraits of local Bukharans. Overall we enjoyed our three days in Bukhara. More would have been too long as it’s not the largest town in the world, but it was so hot it was nice to retreat back to our guesthouse (the hospitable Sarrafon B&B) in the afternoons for a rest in the shade. After Bukhara, we got in a car and were driven seven hours across a flat and featureless desert to the next stop – Khiva. Oh, and the title for this post? If you ask a Bukharan shopkeeper, everything they sell is “almost free”. This entry was posted in Places and tagged Bukhara, mosque, Uzbekistan on October 4, 2014 by Jo Harris. 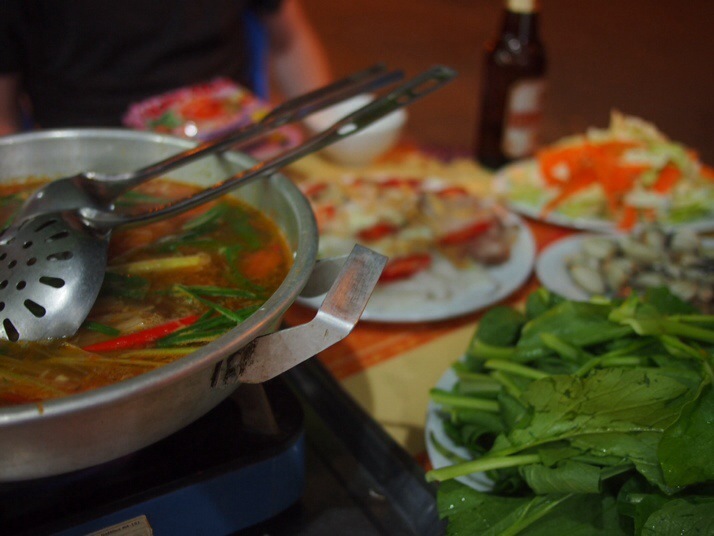 This is a guest post from our good friend Jo who came out to tour Vietnam with us. 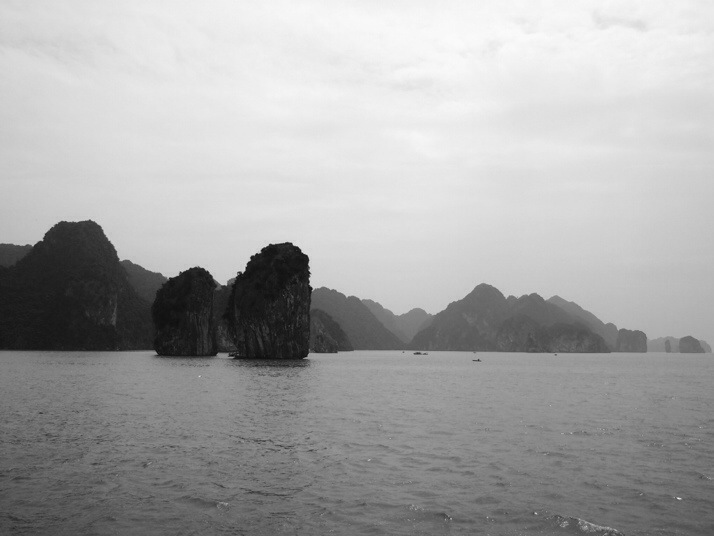 Take it away, Jo..
One of the things you’re Supposed To Do in Vietnam is Ha Long Bay, which has featured in several films – the one most people will probably have seen is Tomorrow Never Dies, that otherwise rather forgettable Brosnan Bond movie. It’s a vast area of tall karst (limestone) islands jutting out of the sea. It’s beautiful, and it attracts a lot of tourists. Every hotel in Hanoi advertises Ha Long tours and there are all sorts of options. So we’d concluded, in doing our research, that we ought to see Ha Long Bay, but we were rather put off by the thought of hordes of tourists. However the ever-helpful Lonely Planet says that if you go to Cat Ba Island, you get to see pretty much the same scenery with far fewer people. Cat Ba is reached through a long, but not too tedious, bus-bus-boat-bus trip which took about four hours. Our bus out of Hanoi was filled mainly with tourists, plus a few locals, and kept stopping as we left the city to cram yet more enormous parcels into the luggage lockers, deliveries for the city of Hai Phong. As we got into Hai Phong the bus stopped periodically for a very efficient off-loading of the goods. The whole thing was really well-organised, with only short waits as we transferred from one bus to another bus to the boat to another bus, and while long, it wasn’t at all tiring. The town of Cat Ba is small, a bit developed and a bit touristy, but very quiet this time of year. After checking into the hostel we headed uphill for a view from Fort Cannon. Built in the 1940s by the Japanese it was then used by the French and Vietnamese. The view was a bit hazy and we felt the 50,000 dong (£1.47) charged for entry was a little steep, but we did have fun exploring the old bunkers and taking pictures of the cannon and old armament boxes. Dinner in town, after a beer by the seafront, was destined to be seafood hotpot. We caved when one of the restaurant owners who’d previously talked to Julie as we got off the bus gave us his patter, and we were glad we did. We got a dish of broth flavoured with lemongrass, ginger and spring onions, some packet dried noodles, a plate of water spinach, another plate of cabbage and carrot, a plate of clams and one of fish, squid and prawns. You cook the raw food in the hot broth as it bubbles away on a hotplate. It was utterly delicious, even when a small bug jumped out of the water spinach and committed suicide in the broth – anyway, by that point we were stuffed. In the morning we were up early for our day’s tour out to Ha Long Bay and the closer Lan Ha Bay, which has much the same sort of formations. 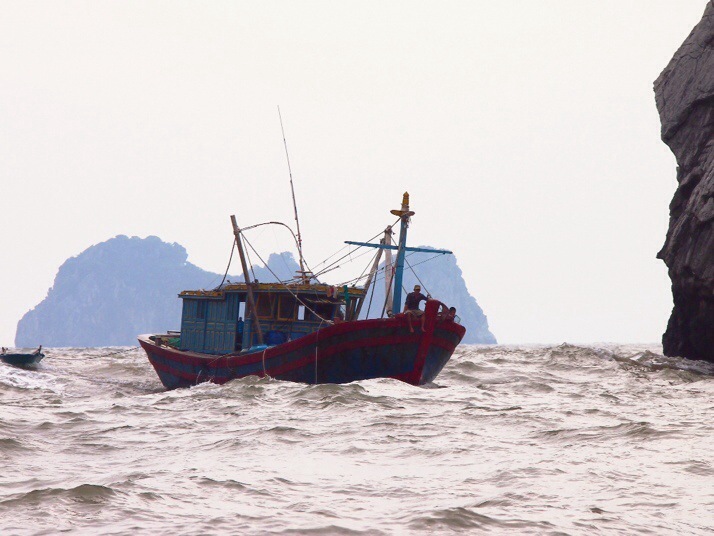 It was a windy day – further south, we later discovered, Central Vietnam was being battered by Typhoon Nari – but we got on the boat and chugged out into the harbour. Just before we exited, through a channel between two rocks, it was starting to get a bit rough and a couple of big waves came crashing over the open bows of the boat. The pilot promptly turned around and they called for a bigger boat. Once on board the bigger boat, our group of 20 spread out on the upper deck and off we went again. She rocked and rolled for about half an hour before it got calmer and more sheltered, and about that time the scenery went from “oh, that’s nice” to “wow”. 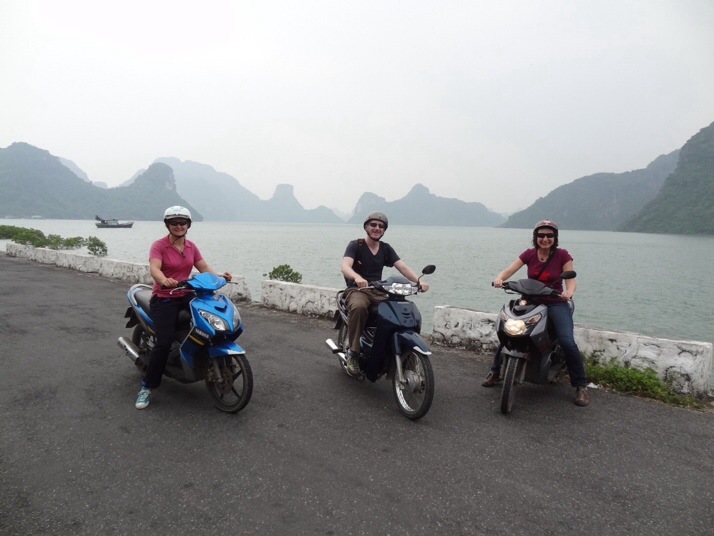 We cruised through the karsts for perhaps two hours, past floating fishing villages and waving at passing fishermen, moving from Lan Ha to Ha Long. The group was a mixed one; there were a couple of Yorkshire blokes, a nice English couple, some crazy Italians, a French and Israeli couple, two German lads and a young Vietnamese couple. The Vietnamese girl astounded me and Julie by appearing in properly high heels, though she had also managed to pack a bikini for the watery parts of the trip. Just before lunch we pulled up – with a couple of tries – next to a karst island, and scrambled ashore into a cave in the middle of the rock. 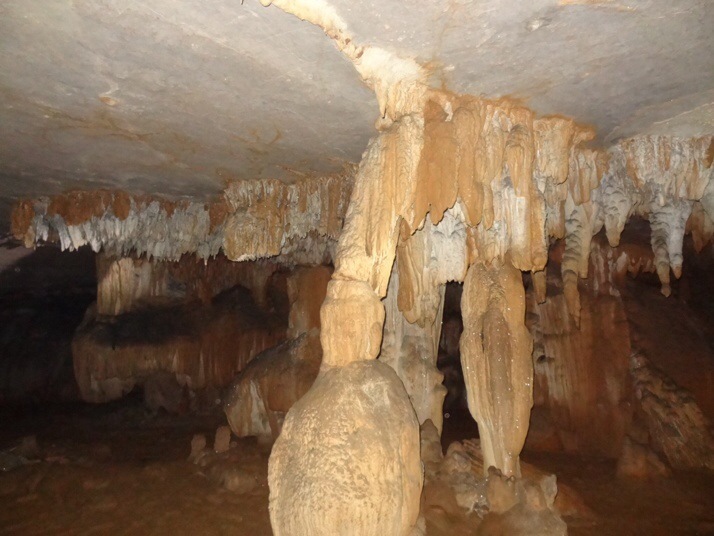 I would not recommend flipflops for caving, but there were some spectacular stalactites and stalagmites hidden in the darkness. Lunch was a feast of rice, fish and some pretty good spring rolls. Shortly afterwards we got the chance to work it all off with a spot of kayaking. Sadly, they had no one-man kayaks so I had to manoeuvre a two-man by myself. 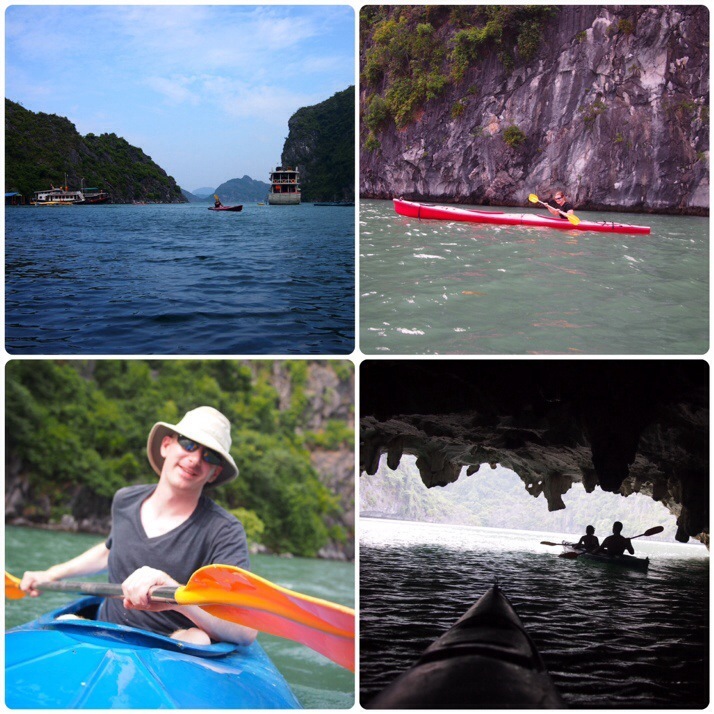 We loved this bit of the day, kayaking through arches in the rock with bats squeaking over our heads. Then there was a swimming stop, where I failed to jump off the edge of the ship but Andrew, encouraged by one of the Yorkshire men, leapt off the very high stern into the warm green water. We cruised home, happy, coming into port past an enormous floating village – a town, really, with canals separating the floating houses. On day two the wind had got up even more. With most of the day to use up before the bus we planned to get back to Hanoi, we rented scooters for a tour of the island. While Andrew has a proper bike licence and has ridden big motorbikes in the past, my scooter experience consists of tootling very slowly around Aitutaki in the Cook Islands a few years back, and Julie had never been on one before. It turned out we were basically borrowing people’s personal scooters – I had one which belonged to the hostel receptionist – which just added to the nerves. They spent a while showing us how to start and brake, and fiddling with the dodgy battery on mine, before waving us off. Actually once we’d got through town and the random people stepping or turning out in front of us it was pretty easy riding, with the traffic predominantly two-wheeled save for the odd bus or truck. By the time we made our first stop Julie and I were feeling much more confident. That stop was at Hospital Cave, built by the Vietnamese with help from China in the 1960s. It acted as a hospital and hide-out for the Vietnamese forces, and as well as a first-floor network of concrete bunker-like rooms there’s a huge second-floor cave, with space for a cinema and a small swimming pool, and a third floor we weren’t taken to by our guide. It was a bit bare and damp, but you can imagine the claustrophobia of being hidden away there from the American bombing. Then we continued on our way, doing a loop inland and then back along the coast, via ‘butterfly valley’ – in fact there are lots of stunning butterflies everywhere on Cat Ba, from small yellow and blue ones to enormous, velvety-black specimens. Sadly the really big ones never sat still for long enough to have their photograph taken. We stopped for lunch in a small village, randomly picking a place with a sign outside it. 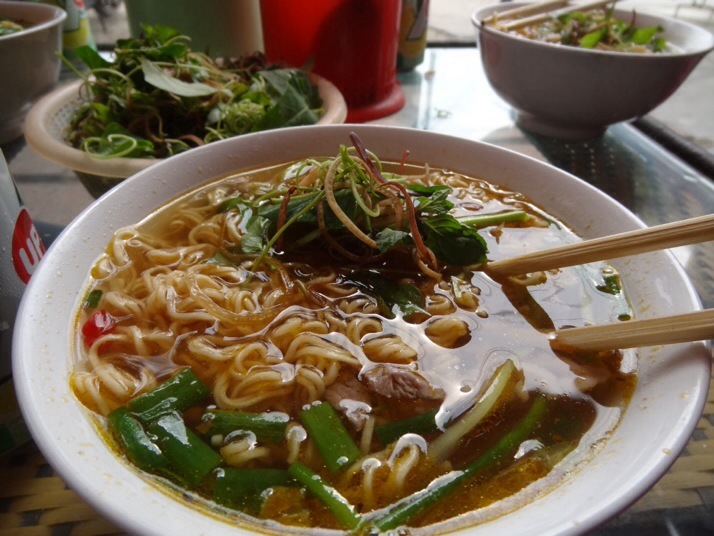 The family seemed a bit surprised at suddenly having three Western customers, but set to and delivered us three bowls of (instant) noodle soup with mystery meat and a bowl of the herbs you put in soups here. None of us could decide what the meat was; it was vaguely liver-y but also fatty. With a little more petrol in the tank (though not quite enough, I had to top up by buying a water bottle full on the way home) we decided to head back up our original road and then carry on north as far as that road went. 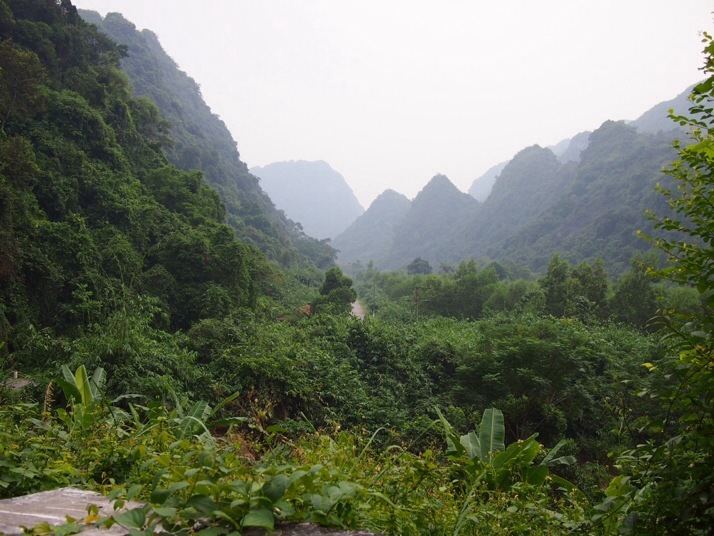 It was a good idea – the scenery was stunning, through deep valleys of bush-covered karst, out to the sea at the end of the road. We ended our Cat Ba stay with another bus-boat-bus-bus combo, only this time with far more locals than tourists. 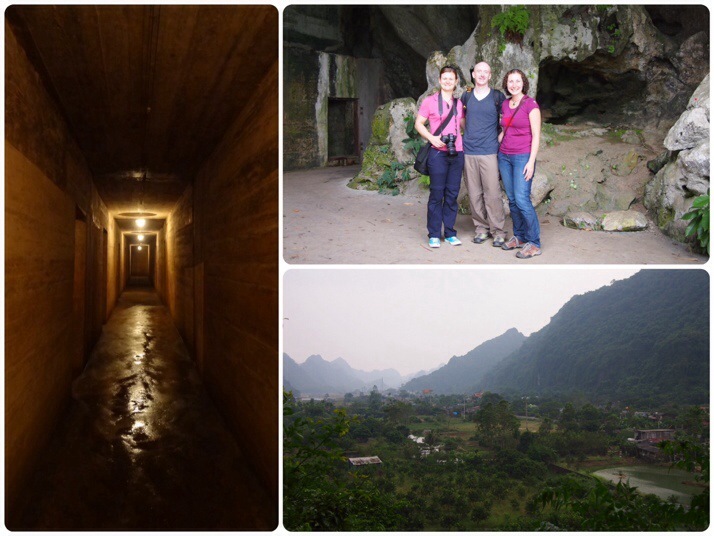 The Haiphong – Hanoi leg was slightly crazy. We were ushered on to the bus at the side of the road without even being allowed to put bags in the luggage compartment, so we all piled bags on an empty double seat. But then more people got on. And more. The conductor pushed bags into laps and set out little plastic stools in the aisle, and at various points en route to Hanoi more people would get on and off. At journey’s end, we were nabbed by a taxi driver with a rigged meter who tried to charge us three times the going rate for the trip to the train station, and there we waited for the overnight to Dong Hoi. But that’s another blog. 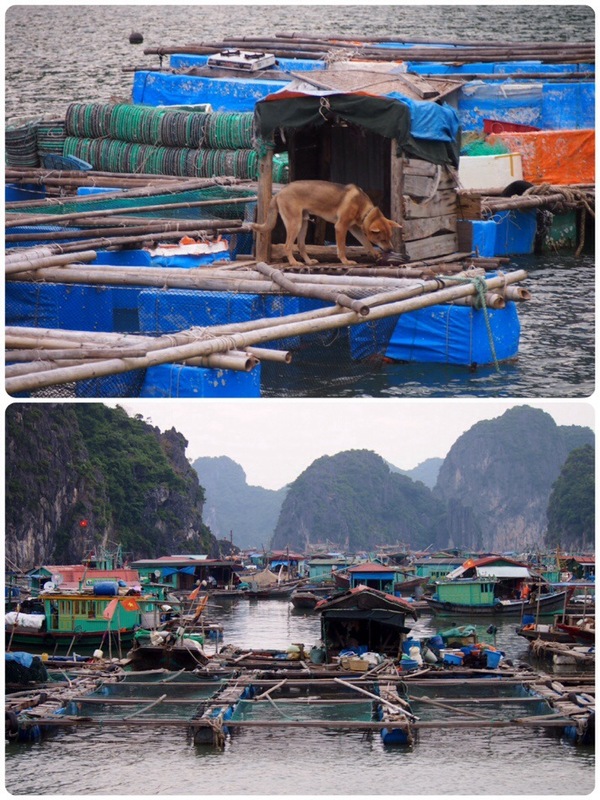 This entry was posted in Places and tagged Cat Ba, Cruise, Vietnam on October 28, 2013 by Jo Harris.